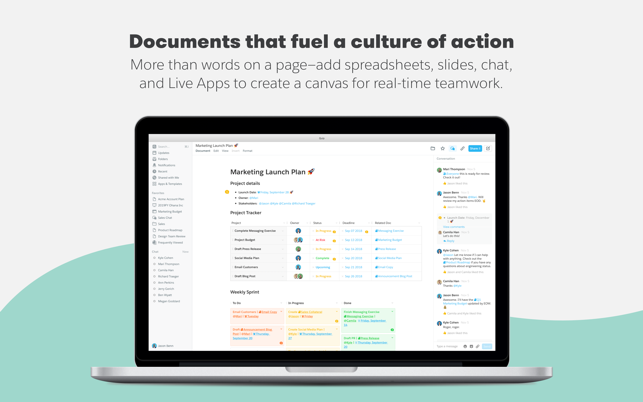 Quip is a place for teams to create living documents. 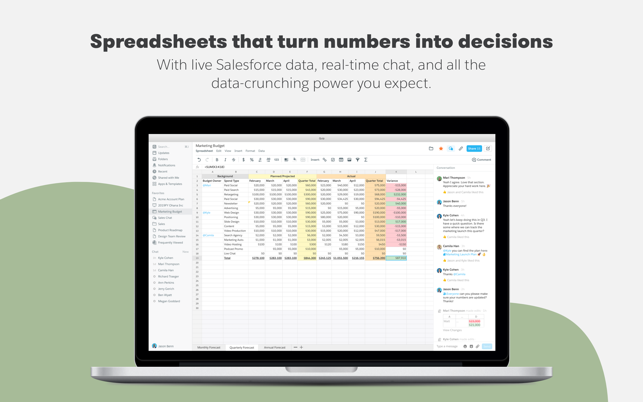 It combines chat, docs, slides, and spreadsheets in one app — making collaboration fast and easy. Skip the endless emails, meetings, document versions by working simpler and faster with Quip—available for your Mac, iPad and iPhone. Watch your team and your work come alive. Take notes, share grocery lists, organize task lists, edit docs with your office coworkers, collaborate with any group or team on projects. Real-time chat and messaging is integrated seamlessly for easy collaboration, so you never have to switch to email. Embed beautiful, full featured spreadsheets with support for over 400 functions and a customized mobile keyboards that make editing a pleasure from any device. 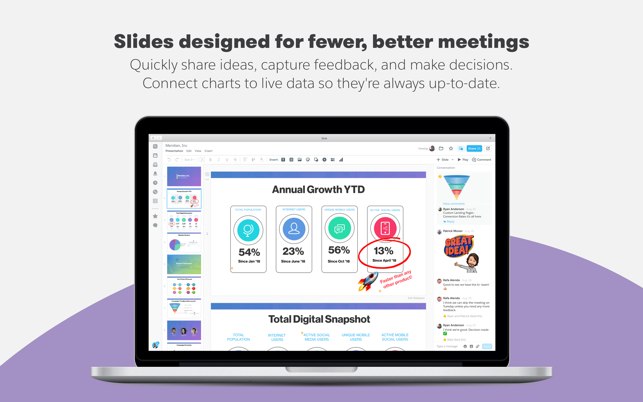 Quip slides are designed to get everyone aligned with fewer, shorter meetings—or no meetings at all. Use interactive polls and prompts to ensure that real decisions get made. 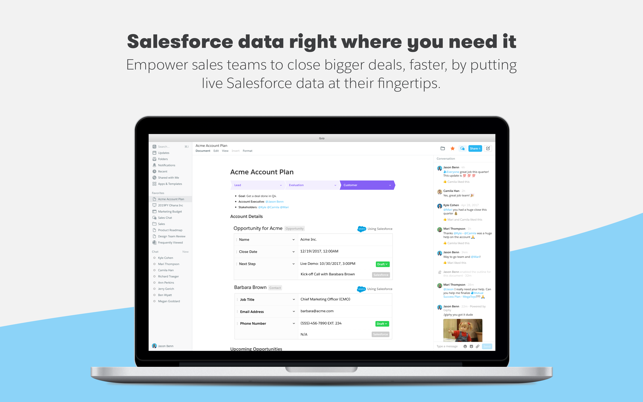 Create charts using live data from spreadsheets and Salesforce records. They’ll always stay up to date, and your team will too. All of your chats, docs, task lists, and spreadsheets are available on all of the devices you use — iPhone, iPad, and desktop. Easily review changes, comments, annotations to your docs and spreadsheets from your iPhone and iPad. Import your documents from Dropbox, Evernote, Google Drive, Box, Google Docs, and more. Export documents to PDF and Microsoft Office. Export spreadsheets to Microsoft Excel. Import your address book from Gmail, Yahoo, Hotmail, Microsoft Outlook, Google, or iCloud. I use quip for everything and it literally saved my life so many times because I have quick access to important files in situations where I unexpectedly need them. I'm much more organized, acheive my goals faster and easier, and I love the immediate and accurate syncing and accessibility that makes google docs, evernote, apple notes, microsoft onenote etc. seem like stone-age productivity apps. I've already recommended this app to all of my friends. I know they probably put all the formatting options in the doc at the upper part of the page to help the people of the stone-age feel more oriented and comfortable which is good. However, for the adaptable, high-demand users who have a trememnous amount of work to do and have fullly converted and committed to this app, this update has crippled my productivity and efficiency by having to incessantly toggle up and down the page for every nit-pickly little change in format I need to make in the doc. The quick access bar should remain for those who wish to be fast, and the new upper tool bar should stay for those who are converting from more conventional formats and are more comfortable with the editing tools to be in a less efficient position. Please help us lifers stay, well, productive! Our team at work uses Quip, but I have yet to find a feature it has that Google Docs doesn't do better except load-time. It's pretty unstable and crashes a few times a week. The UI is frustrating too, for example every time it opens it shows a history of edits that has to be closed for every document every time you open the app. I downloaded the version from the app store hoping it'd be more up to date but it has an endless loop password-promt. If you get that, download from their web site instead of via app store & you only have the frustrating bugs, not the makes-it-unusable bug.